Both of these are sleepy riverside hamlets that, like Amphawa, are clustered around canals as they merge with the Mae Khlong river. 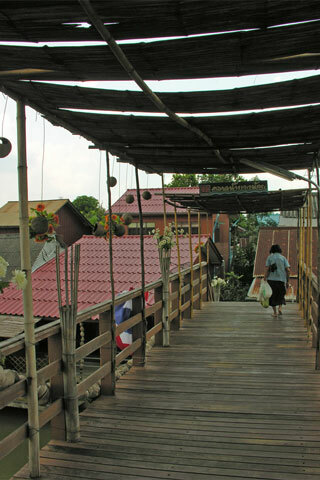 Also like Amphawa, both are home to similarly old teak wooden houses and both have floating markets on the weekend. You might be wondering why visit these towns if they’re so similar to Amphawa? The answer is that they don’t attract anywhere near as many weekender tourists, making the atmospheres of each a refreshing break from crowded Amphawa on weekends. A number of small markets also set up around the riverside temples in each village, and these are great places to wander while sampling countryside specialties like spicy pomelo salad and grilled frog on a stick. A handful of relaxing cafes, shops and small eateries are also found along the canals of each, particularly in Bang Noi. If interested in Christianity, the historic Church of the Virgin Mary in Ban Nok Khwaek is also worth a peek. Both villages may be reached by tuk tuk or boat -- or bicycle if you’re up for a long ride -- and one or both of them are worthwhile add-ons to a trip that could also include Wat Kai Bang Kung.